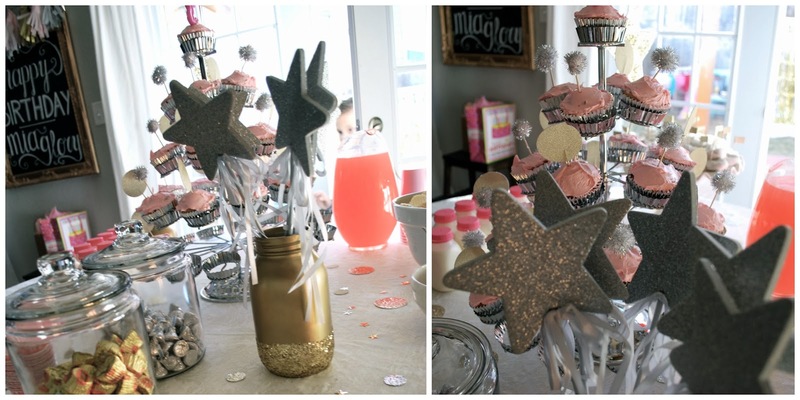 Bits of Splendor: Mia's 3rd Birthday- Sparkle & Shine. We celebrated Mia's birthday at the end of November...right before all the craziness of December happened. Which is why I am just now getting around to sharing her day with y'all. I loved her theme. It was so fun to go off of her love for all things "glitter-ly." That girl loves all things that sparkle. Hence the theme: Sparkle & Shine. I kept it simple so we just invited family. Which honestly with as many cousins as the kids have, it's the perfect built in party. Just the right amount of people. I set up a little photo booth for the kids in the backyard. I found props in the Christmas section of Target. It was a kit perfect for Holiday parties, I just left out the Christmassy stuff. It had little mustaches and sparkly lips and glasses. It was so perfect for her party. I also found top hats for the boys from Target in the dollar spot. Originally they had red plain ribbon so I took it off and glued on white satin ribbon. I found the gold backdrop at Party City and just hung a white sheet behind it on the fence. The tutus and dress up bar were borrowed from the girls room. 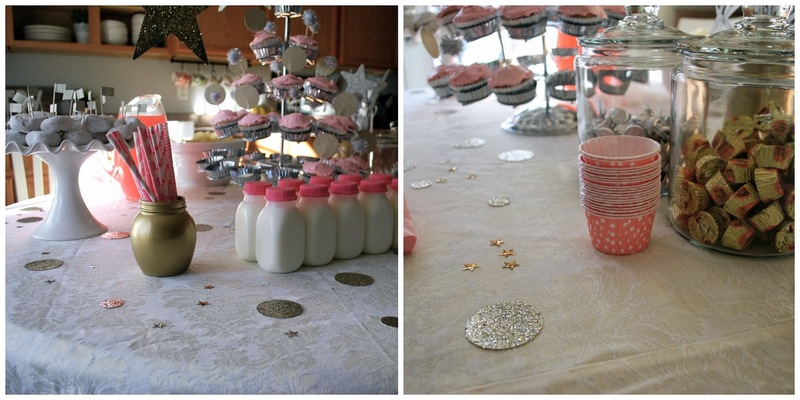 I made large glitter confetti circles for the table using card stock and a hole punch. The little flags on the powdered donuts were made with toothpicks and glitter washi tape. The cupcake toppers were from a bag of christmas colored poms I found at Hobby Lobby. Just hot glued the silver ones to toothpicks. The silver glitter star wands were from Target. Pink polka dot treat cups, favor bags, paper straws and little milk bottles are from Shop Sweet Lulu. It was all so easy and very laid back. We had a lot of fun and Mia really loved her party. In fact she said it was the best party ever. So basically when you're 3 year old tells you that, you know you did good. Cause obvi she's lived a long life and been to a lot of parties. Still can't believe she's 3. 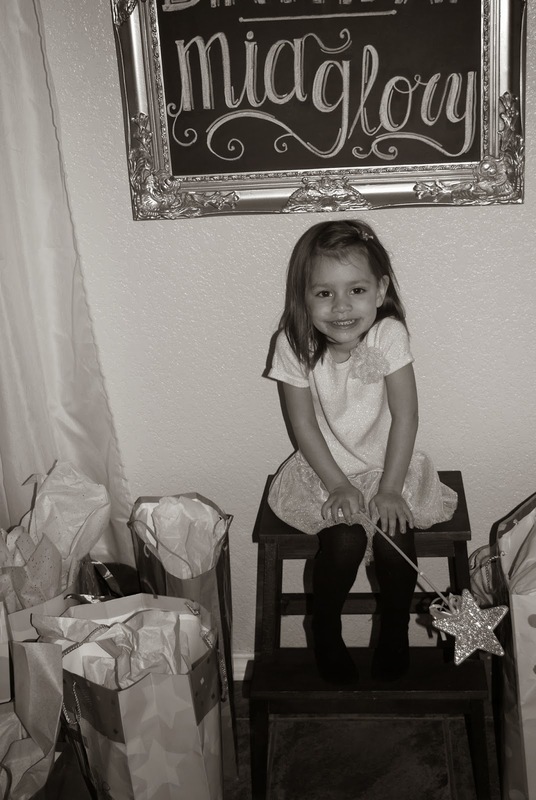 Even though she now proclaims herself a "big girl," She will always be my little peanut. She is strong willed, free spirited, determined, loves makeup, and picks every outfit based on how well the dress or skirt twirls. She is feisty and hilarious. I'm so thankful for our Mia Glory. Our sunshine girl. Goodness I just love her so much. 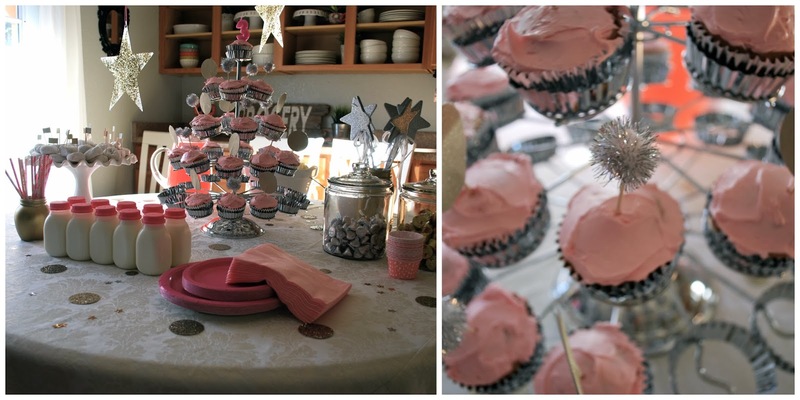 This is the cutest birthday party ever! 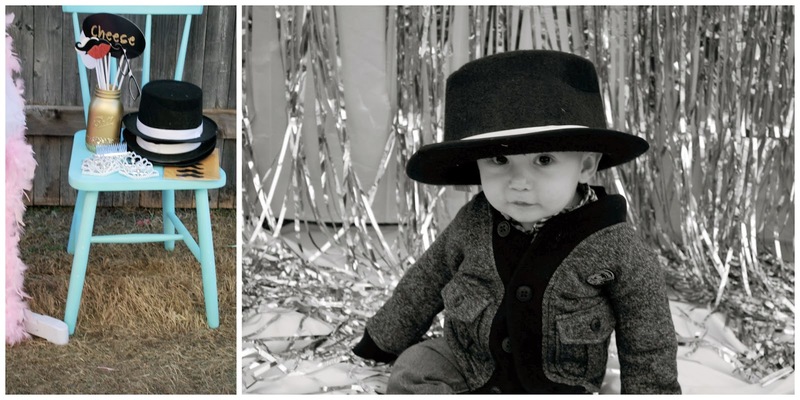 I love that photo booth you set up for the kids, absolutely adorable! I LOVE THIS!!!!! This is all so wonderful and cute! Emerson's nursery is peach and gold so this would be perfect for her first birthday....which is WAY away...but still...so cute! Love it all! You are so creative!!! happy birthday Mia! Oh my gosh, what a perfect theme and everything looks so beautiful! How did you make the chalkboard sign? It's beautiful! You didn't freehand that did you? If so then I am amazed! LOVE those little milk bottles! Everything is so cute! You did such a great job ! The kids are all super adorable and I love the decor! Happy Birthday Mia Glory!! What a fun party. You did a really good job. I would love a party like that...tehee. You make such wonderful birthday memories. What a cute party theme!! !